The key advantage of Springer signs is that they move and sway with wind. Supremely portable, they can be taken indoors at the end of the day or quickly repositioned as needed. 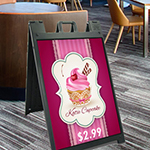 Grab your customer's attention with our 36x24 Metal A frame sandwich board sign printing that is highly demanded for restaurant deals and offers. Printinxpert has a wide variety of sign frames in stock to meet your needs, and our outdoor freestanding signs are constructed of durable plastic or metal that can survive most weather conditions. If you are looking to advertise in a windy area or somewhere that might experience harsh weather, use Springer signs to make your message last. A-Frame Signs can be used to advertise along the roadside, while colorful Sidewalk Signs are effective in capturing the attention of people on foot. Restaurants, cafes, coffee shops, bakeries, bars and other storefront retailers who attract heavy foot traffic prefer to use A-Frame signs. Our 36x24 Metal A frame sign printing for coffee shop can be a great choice for promoting any special event or opening. Sidewalk advertising campaigns can be used to announce sales offers, promote daily meal specials, and convey any message retailers wish to advertise. 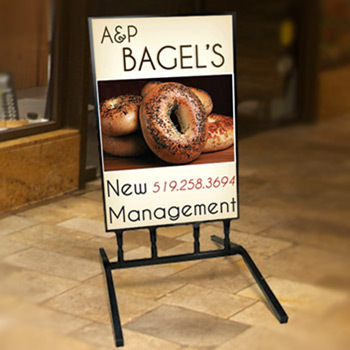 A Frame Signs, including sidewalk signs and sandwich boards, are advertising tools every store owner should reach for. 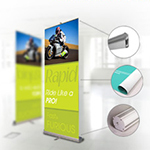 Their low cost enables these outdoor displays to pay for themselves in a short time. Increase your sales for the day by ordering our 36x24 Metal A frame sign printing for flower shop. Reap the benefits of a little storefront advertising! These a frame signs are portable sidewalk signs, able to fold up or roll to wherever they need to go. Able to change messages or posters quickly and efficiently, sandwich boards work hard at driving traffic to your establishment. We also offer full color signicade plastic deluxe A frame signs and custom made wind plastic A Frame Signs for advertising. The material used for the printing of A Frame signs is Corrugated plastic which will display your message. This material is long lasting and and gives perfect look to the message which is to be displayed. We offer full color printing on both sides of the sign. Metal Flex A Frame Signs Signs make a versatile, durable and affordable advertising solution. Business owners and marketers realize now more than ever the importance of targeted messaging and promotion. Marketers need to deliver different messages through different channels to reach prospective clients. The 36x24" side walk sign printing for salon and spa is a great and cheap advertising tool. 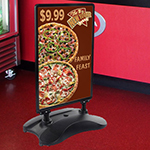 A frame signs, sidewalk signs, enable users to conduct 24 hour advertising. These changeable a frame signs, letter signs, outside bulletin boards and write-on message boards are built to withstand the elements in most weather conditions day or night. Each product line in the A-Frame and Sidewalk Sign collection was developed to keep your posters, banners, brochures, sidewalk signs or messages, intact regardless of the weather such as by having our Metal A frame sign printing for lunch special . Many sidewalk signs are manufactured from light-weight materials but can be adjusted to withstand wind or weather by adding sand or water to their bases, which gives you convenience and durability with functionality. Sidewalk signs, also known as promotional signage and a frame signs, help to increase sales.Sidewalk displays with brochure pockets are designed with real estate offices, car dealerships or any after-hours business in mind. Order our Metal A frame sign printing for ice cream parlor today. These outdoor fixtures have clear front windows for fully visible brochures. The top lid protects printed literature from getting wet or blowing away. "The Metal Flex A frames are perfect for what I need to advertise my business. I had ordered all of them and I'm pleased on how sturdy they are and the quality of them. They are alot bigger in person and I am very pleased with that. Everyone that has seen them, loves them and thought they were perfect. Just what I needed and was looking for." I really loved the sidewalk sign you guys made for my flowers shop. I got exactly what I wanted. Is this material resistant to weather? Yes this material is weather resistant. Outdoor quality lasts 3-4 years. We High Quality Durable A-Frames signs. The material used for printing is 4mm Corrugated Plastic. - Dual Spring Flex designed to bend in strong wind and return to an upright position. The metal frame gives durability to the sign. The material used for the printing of Signicade Sign is Corrugated plastic which will display your message. This material is long lasting and and gives perfect look to the message which is to be displayed. Full color printing on both sides of the sign with any designs. Print As It The files you uploaded will be printed as the same way they are without any changes. Production turnaround begins the following business day for all jobs sent to press by the deadline. For 48 Hours Turnaround, production time begins the same day if file is sent to us by 12 pm (noon) CT.